Andy Warhol Collection, New York. This work will be included in the forthcoming supplement of the Twombly catalogue raisonné being prepared by Heiner Bastian. 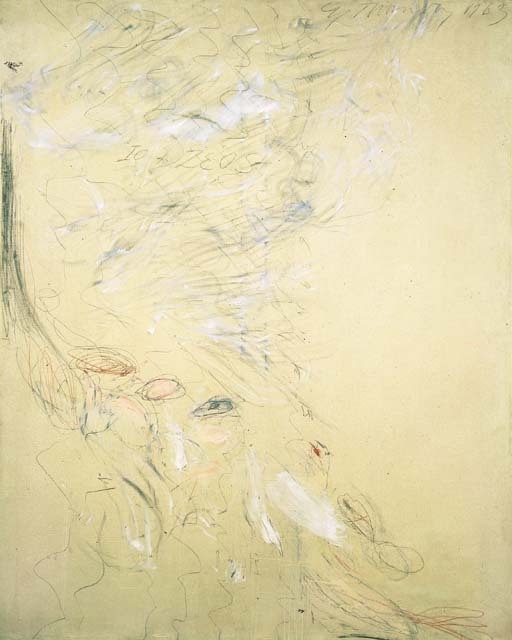 After Twombly moved from New York to Rome in 1957, the ancient Mediterranean culture of the city began to exert a powerful influence on both the style and the subject matter of his paintings. Executed in 1963, Io and Zeus is such a work, whose title refers to the story from Greek mythology in which Io, a young priestess from Argos was seduced by Zeus, the King of the Gods. Using his powers as a god of atmospheric phenomena - the one who lights the sky or covers it with clouds, makes it thunder, rain or snow and throws lightning bolts - Zeus transformed himself into a cloud in order to romance the priestess. After seducing Io and in order to hide his adultery from his wife and jealous queen Hera, he transformed Io into a white heifer and hid her among a herd. Hera was not, however, fooled by the metamorphosis and demanded Zeus consecrate the animal to her. Io's fate was then entrusted to the guard of the hundred-eyed monster Argos. She was soon freed by Hermes, but Hera, ever vengeful, cursed Io with a gadfly which tormented the heifer and Io was consequently doomed to wander furiously through Greece and into Egypt where she eventually gave birth to Epathos. Like many of the artistic representations of the subject, Twombly's Io and Zeus concentrates on Zeus' seduction of Io in the form of a cloud. Like many of his own paintings of this period, the painting explores the fleeting and transformatory nature of space and light. Zeus's cloud-like form is rendered in ambiguous layers of paint that descend in a winding swirl towards the lower half of the canvas where more concentrated, sensual and material flesh tones suggest the movements of Io. Twombly has revelled in the opportunity offered him by the myth to contrast and intersperse the ethereal with the material. Both these contrasting areas are composed of numerous scrawls and gestural brushstrokes which collectively direct the eye towards the lower right of the canvas where the sexual union of these two contrasting elements is suggested by two forms that join together to create an infinity-like symbol (8).